Thrace Pack plant in Ioannina won the gold award during the 5th Environmental Awards ceremony, that was held on Tuesday 10th of July 2018, in Ariadne Estate. 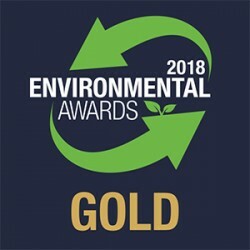 Thrace Group was one of the few companies that won a gold award for their environmentally-friendly performance and operations of their facilities. The winning companies were elected by an independent board consisting of experts, scientists and environmentalists. This year, there was a significant increase in number of the submitted applications, a fact that underlines the growing importance of rewarding initiatives and practices of the private sector, that contribute to sustainability and at the same time to the local economy. The awards were organized by Boussias Communications, sponsored by MAS and supported by Redex.